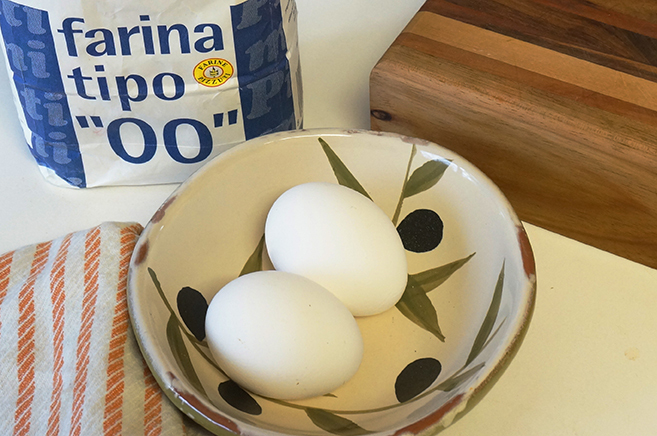 Take heed, university student: if you have flour and eggs at your house, you have pasta. And if you have olive oil and garlic as well, you have dinner. The amounts described below are approximate. As a rule of thumb, you need about 200 g (1 cup) of flour for 2 eggs. That makes enough pasta for two people. 1. Make a mound of flour in the centre of your clean working space. 2. Make a well in the centre of the flour, and break two eggs into the well. 3. Use a fork to break the yolks and stir the eggs, gradually incorporating the flour into the mixture, a bit at a time. 4. Once most of the flour has been incorporated into the eggs, knead the dough until it begins to have a glossy appearance. 5. After kneading, leave your dough covered with a dishtowel for at least 30 minutes. Kneading caused the gluten in the dough to tighten up, and now you are letting it relax. This is an essential step. While waiting for the dough to relax, start thinking of what sauce you will put on it later. A very simple solution is to sauté some garlic at low heat in olive oil (gently – garlic burns easily), and stir it into your cooked noodles later. 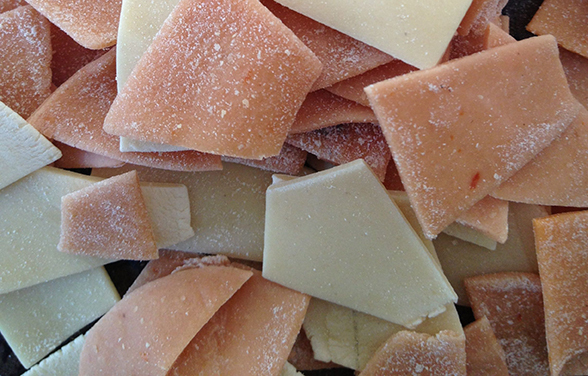 If you have some parmesan, get grating. 6. Cut the dough into two pieces. You are going to be rolling out one piece at a time, so keep the other piece covered, so it doesn’t dry out. Each of the pieces of dough serves one person. 7. Roll each piece out as thinly as you can, with a rolling pin or empty wine bottle. It helps to roll from the middle outwards. 8. Once rolled out, use a knife to slice noodles into ribbons. 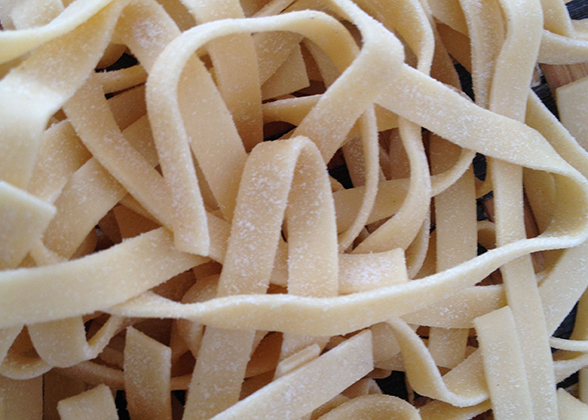 Try to keep all of your noodles approximately the same thickness, so that they will cook at the same rate. 9. Repeat rolling and cutting for the remaining piece of dough. If you don’t feel like rolling the rest of the dough, you can keep it in a plastic bag in the freezer for another day. Remember that the dough will need time to thaw and relax before rolling later. If you want to keep rolling, but don’t want that many noodles today, you can hang the extra noodles to dry over the back of a chair overnight. The shapes and sizes of pasta noodles each have their own name. If yours look like this, you made fettucine. 10. Set a pot of water to boil. Once boiling, drop in your noodles and leave the lid off. Check your noodles for doneness every two minutes. Noodles are done when they are “al dente“, meaning that they are soft, but are still firm to the bite. Fresh noodles cook very quickly so be careful! 11. Strain noodles and stir in some sautéed garlic and oil (this is called aglio e olio in Italy). Add some grated parmesan or parsley, if you have some – if not, no worries. You are done! P.S. If anyone tells you that there is no protein in your dinner, just tell them you had an egg. It’s true.